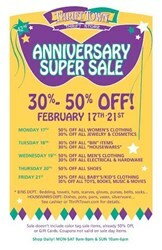 To celebrate 42-years of thrift with the communities that have helped them earn multiple Best of Thrift awards, raise over $250,000,000 for their local charity partners, and in keeping billions of pounds of product out of local area landfills, Thrift Town is hosting a blowout, week-long anniversary super sale, full of dizzying low prices. 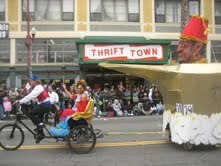 42-years-ago the Thrift Town opened its first store in the beautiful San Francisco bay area. To celebrate 42-years of thrift with the communities that have helped them earn multiple Best of Thrift awards, raise over $250,000,000 for their local charity partners, and in keeping billions of pounds of product out of local area landfills, Thrift Town is hosting a blowout, week-long anniversary super sale, full of dizzying low prices. 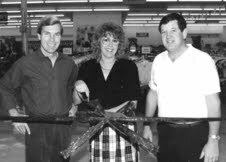 Thrift Town was founded in 1972 by Bud & LaVey Norquist and Steve Moore. Their goal was to make Thrift Town a clean, well-lit, and organized place to shop with well-priced merchandise. The founders were committed to making an honest living, as well as helping to raise funds for charity. This same commitment holds true with the next generation currently running the business. "The concept of our business is extraordinary. Not only is our company good for the community, it is also good for our charity partners, the environment, and our crew members. We have built our business on providing a fun work atmosphere, competitive wages and excellent benefits to our employees." ~Wendy Steinmetz, Co-Owner. Thrift Town has 14 stores locations in three western states. Thrift Town lives its vision statement of being committed to making a difference every day. Each of their clean, bright, and organized stores put out 4,000 new products daily, setting them apart in the thrift world as the premier thrift destination. Thrift Town is owned and operated by Norquist Salvage Corporation, which has spent over four decades dedicated to socially responsible recycling. For more information, or to get connected with Thrift Town, visit thrifttown.com, Facebook/ThriftTown, Pinterest/pinthrifttown, Instagram and Twitter @thrifttown or #thrifttown, and can also be found on YouTube and Tumblr. Thrift Town also has a robust customer appreciation VIP program which provides consumers exclusive coupons, sale alerts, and automatically enters members to win valuable and fun quarterly giveaways.